Commemorative Brick Pavers Available Now! 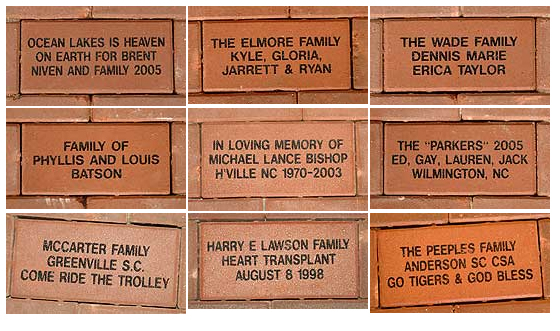 Commemorative brick pavers are available for families who dream of always being part of Ocean Lakes. The “L” shaped walkway from Sandy’s Soapy Suds to Sandy Mart will have groups of bricks inset in a rectangular formation. Each inset has about 300-400 bricks grouped together. The bricks will be installed into the walkway in groups. There are a limited number of bricks. 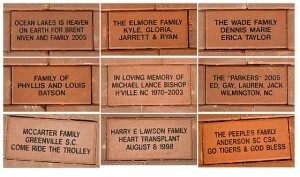 The brick pavers are a great gift for the beach lover in your family, or in honor of a loved one. The bricks are $100 and include 3 lines with 21 characters per line (including spaces and puncation). Proceeds will be divided between our company’s designated charities. Need some brick ideas? Here are some of the bricks we installed…. Email us with your street address and we will mail one to you. Call Ocean Lakes Toll Free Reservations Line 877-510-1413 to have one mailed to you. Call Ocean Lakes Marketing Department at (843) 828-4829 to have one mailed to you.